Often the first volume of a multi-volume set carried the frontispiece, leaving the others without adornment. Investors in this early 19th century edition of Dramas and Other Poems by Metastasio (Pietro Antonio Domenico Trapassi, 1698–1782), thought otherwise. Each of the three volumes contain a frontispiece evoking a dramatic scene, like this one of Zopyrus striking at Zenobia, while Rhadamistus readies himself to prevent the action. Drawn by Thomas Stothard (1755-1834), a Royal Academy member, and friend of William Blake, the image is apt, especially for Metastasio, who was known to conjure up dramatic situations in his works. This scene was engraved by Anker Smith (1759–1819), a printmaker and miniature painter, who was related to the translator, John Hoole. 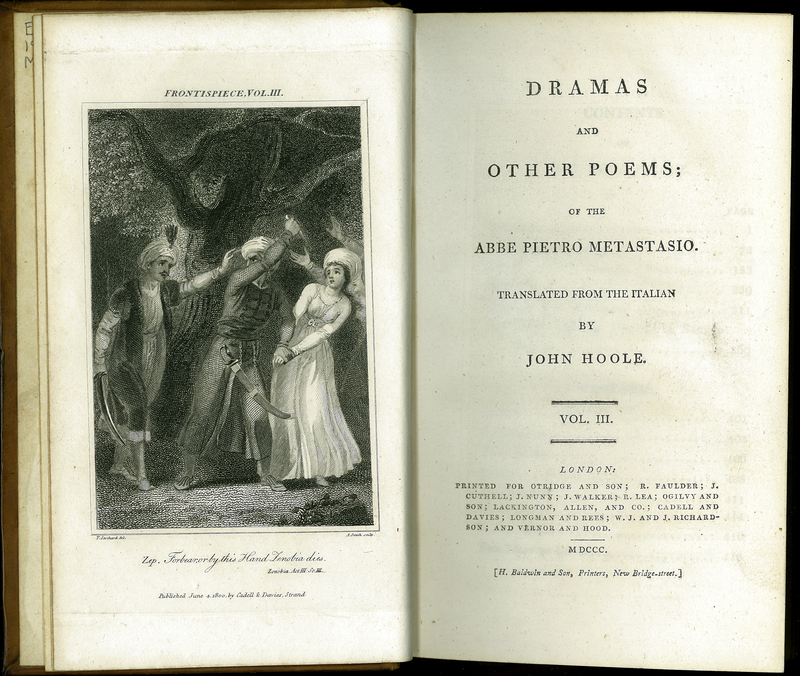 Pietro Metastasio, “Dramas and Other Poems. Vol. III,” ourheritage.ac.nz | OUR Heritage, accessed April 24, 2019, http://ourheritage.ac.nz/items/show/10699.